I'm not one for crowds of people, but one event that I look forward to every Christmas is the Festival of Trees with our friends. It is amazing, it is beautiful, and it is fun! The kids love it, the moms LOVE it, and the dads tolerate it with a scone and a double dose of ibuprofen knowing that Crown Burger awaits them in the end. This year we lasted longer than we ever have before. We have always had a baby in the stroller, with a bottle, needing a nap. This time around we still had a "baby" in the stroller, but no bottle and no nap required. And it made all the difference. These two are inseparable when Aaron is around. In fact, Jack even does a little gallop around the kitchen when Aaron comes home from work. Yes, they love each other that much. I HATE (loathe, detest, really hate) pictures of myself. This one included. But, there's a story here. Actually, it's last years story that we fully expected to reoccur this year. Last year, I helped Max and Charlie make these little reindeer hats/visors with glitter sprinkles. You can see the examples in the background. 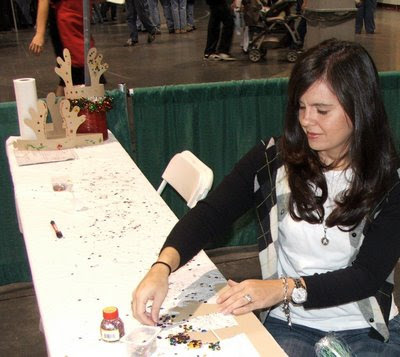 And last year, I apparently used too many glitter sprinkles because one of the helper ladies busted me over it. Which is why when I sat down to make a reindeer hat for Jack... Aaron was ready to capture me fighting with the helper lady over glitter sprinkles. But I didn't get busted this year, and the hat turned out AWESOME! This is their favorite- fishing for suckers! cinnamon roll that they were "sharing"... and he wanted it on his stroller tray. All to himself. Sad baby. Maddy and company. Way too cute for their own good. I knew I should have gone this year! It looks so much fun. Next year for sure! How fun! I love your photographic proof that you didn't OD on sprinkles. At least, I don't think so. OHHHH How fun! You did a fabulous job putting the glittering on Reindeer's antlers... in fact you gave me an idea to use it for my students. See...another reason why I need to move back to Utah! Reindeer and suckers and trees. Oh my! And you should be posting pictures of yourself all the time...you are beautiful!!!! Looks like fun! We'll definitely have to attempt to take our kids next year. I don't know why you don't like pics of yourself...you are so cute! the kids are big and i love maddy's hair dark. SO upset I missed the festival this year. Bummer. Looks like you had a super fun time.